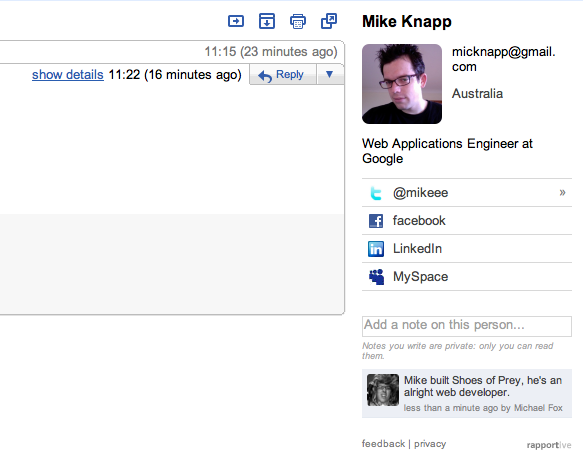 We're answering a lot of Shoes of Prey customer emails using Google Apps for your domain and Gmail. One of the downsides of using Gmail is that there aren't really any customer relationship management tools integrated into it. a note I've made to myself about Mike. And Rapportive has even pulled a dodgy photo of me that I clearly have somewhere up on the web. Naturally they're only using data that people have made publicly available, and they're doing an impressive job pulling data from all these different sources. Rapportive only launched very recently and it's still early days so the service doesn't work perfectly. There are also lots of things they could add. A feature I'd love to see is a link to previous email threads I've had with a particular customer. Judging by their suggestions from other users list they'll be adding a lot more features soon. So if you're using Gmail to communicate with customers, I'd recommend trying it out!